Prologue The action takes place in the rich and glorious kingdom of Tsar Berendei, in legendary Russia. It is a bitterly cold, moonlit night. The forest is covered with snow. 04:20 Fairy-Spring (Spring) descends to earth, accompanied by birds. Fifteen years have passed since the she gave birth to the Snow Maiden (Snegurochka), the daughter she bore with Father Frost (Winter), and for those fifteen years, the outraged Sun God (Summer) has given little light or warmth to the earth. 17:00 Father Frost enters, and tells Fairy-Spring he will leave Berendey's land, but someone must protect their daughter from the Sun God, who waits for the first opportunity to kindle the fatal fire of love in her heart. They entrust Snegurochka to the wood goblin. He will take her to live with Bobyl and his wife, childless peasants in the village. 24:05 Snegurochka is happy to live with mortals, as she has long been attracted to them after hearing the plaintive songs of Lel, a village shepherd. 33:00 The villagers enter, celebrating the coming of spring. 41:10 Bobyl sees Snegurochka and rejoices to learn she will be his adopted daughter. Act I Outside a peasant cottage. 03:05 Snegurochka is attracted to Lel, the darling of the village girls. At Snegurochka's request, Lel sings a song, but when the village girls call him, he runs off, abandoning the heavy-hearted Snegurochka. 12:40 Kupava tells Snegurochka of her impending marriage to the young Tartar merchant, Mizgir, who enters with the village girls, but upon seeing Snegurochka, he falls madly in love, jilting Kupava. 28:50 The people are indignant with Mizgir and encourage Kupava to bring her complaints to the attention of the kind and just Tsar Berendei. Kupava implores the creatures of nature to punish her treacherous suitor. Lel comforts the unhappy girl. Act II In the court of Tsar Berendei. Singers glorify the wise ruler. 07:10 The Tsar is preoccupied with the wrath of Summer (Yarilo, the Sun God). To pacify the powerful God, he orders all engaged couples to be married the following day, the Feast of the Sun God. 12:55 Kupava enters and tells the Tsar of Mizgir's betrayal. Berendei orders him banished, but Mizgir pleads the beauty of Snegurochka as his defense. 26:55 When the Tsar learns that Snegurochka does not understand the meaning of love, he understands why the Sun God is angry. Berendei proclaims than whoever inspires love in the snow maiden before the rising of the sun will take her as his wife. Mizgir implores the Tsar to postpone his banishment, as he is convinced he can win Snegurochka's heart. Act III It is sunset in the glade of the sacred wood. Berendei and his subjects celebrate the coming of summer. 07:15 Dance of the tumblers. 11:15 Lel offers a song and the Tsar is so pleased, he offers Lel the hand of the maiden of his choice. 21:10 Snegurochka hopes she will be chosen, but Lel chooses Kupava. Snegurochka is grief-stricken by this development. In the meantime, Mizgir attempts to woo the snow maiden. The wood goblin casts a spell on Mizgir, making him lose his way in the woods. 35:00 Kupava thanks Lel for restoring her self-respect. Snegurochka decides to ask her mother to give her the warmth of a human heart. Act IV Dawn is breaking in the glade as the snow maiden meets her mother. 05:30 Snegurochka's mother gives her a magic wreath which allows her heart to love. 16:35 When the snow maiden sees Mizgir, she falls passionately in love with him. Knowing the sun will soon rise, she bids her lover flee with her to hide from the sun's deadly rays. Berendei blesses the young couples to be married. 26:35 Snegurochka appears with Mizgir, and she tells the Tsar of her new-found love. Just then, the morning mist is pierced by a ray of sunlight which falls on Snegurochka. Knowing now that her end is near, she thanks her mother for giving her the gift of love. 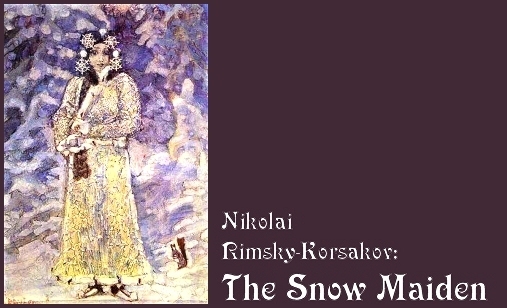 The snow maiden melts away, and Mizgir, in despair, drowns himself in the lake. The people are confused at these developments, but Berendi understands that the snow maiden was a breach in the laws of nature. With her sacrifice, the Sun God is appeased and warmth will once again return to the land. Lel and the people sing a hymn to the Sun God.